According to Rabbinic tradition, the 21st of Nissan is the day in the Jewish calendar on which Pharaoh’s army was drowned in the Sea of Reeds, and the redeemed children of Yisrael sang the Song of the Sea, the (Shirat Hayam, Exodus 15:1-19). The song, as included in the the morning prayers, comprises one of the most ancient text in Jewish liturgy. The 21st of Nissan corresponds to the 7th day of Passover, and the recitation of the Shirat HaYam is part of the daily Torah Reading. Some Sepharadi communities recite a song in Ladino based on the Shirat Hayam, the Ketuba (Marriage Contract) of Yom Vayyosha (the Day of the Song of the Sea). It is the custom of the Ḥassidei Ḥabad to stay up all night learning (just as on Shavuot and Hashana Raba). The day also corresponds with the 6th day of the Omer, Yesod sheb’Ḥesed (Foundation within Lovingkindness) in the order of the lower sefirot or creative emanations. 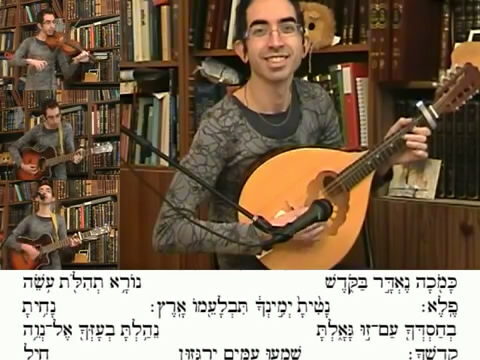 Rabbi Hillel Ḥayim Yisraeli-Lavery shares a performance of a melody he learned for the Shirat Hayam from צוף דבש Tzuf Devash, a Moroccan synagogue in the Old City of Jerusalem. If there is something about this tune that strikes one as particularly celebratory, it might be because the relationship between G‽D and the Jewish people is traditionally described as a marriage consummated with the Covenant at Mt. Sinai. The passage of Bnei Yisrael through the Sea of Reeds towards Mt. Sinai thus begins a bridal march commencing in the theophany at Mt. Sinai, 42 days later. YHVH, which you have made for yourself to dwell in; the sanctuary, my Master, established. the waters of the sea but the children of Yisroel walked on dry land in the midst of the Sea. “And it shall come to pass that as Hashem rejoiced over you to do you good, so G‽D will rejoice over you to cause you to perish” (Deuteronomy 28:63). Now does the blessed Holy One, rejoice in the downfall of the wicked? and Rebbi Yoḥanan said, Why are the words ‘for he is good’ omitted from this thanksgiving? Because the blessed Holy One does not rejoice in the downfall of the wicked. בִּנְפֹל אויביך [אוֹיִבְךָ] אַל תִּשְׂמָח וּבִכָּשְׁלוֹ אַל יָגֵל לִבֶּךָ. פֶּן יִרְאֶה יְהוָה וְרַע בְּעֵינָיו וְהֵשִׁיב מֵעָלָיו אַפּוֹ. When your enemy falls, do not rejoice; when they stumble, let your heart not be gladdened. Lest G‽D see, and it will displeasing in G‽D’s eyes, and G‽D will turn G‽D’s wrath from them [to you]. So how is it that The Song of the Sea is celebrated on this one day, the seventh of Passover? Our god is the god of light and the dark. Our understanding of the non-dual unity of G‽D embraces the reality of suffering in the world as well as our responsibility to challenge G‽D for permitting it. The one time in the year in which G‽D’s divine aspect as Mashkhit (executioner) is dared invoked is on the night of Passover, during the telling of the Passover Haggadah, when G‽D is described through midrash as the Shekhina carrying her sword, protecting her people. The rest of the year we shun from invoking this aspect, I believe, because we want to beckon G‽D’s lovingkindness and compassion (ḥesed and raḥamim) to overwhelm G‽D’s attributes of justice and discipline (din and gevurah), even as these latter attributes were so key in the redemption of Bnei Yisrael from Mitzrayim and their birth as a people. In the worldview of Rabbinic Judaism that I know, the continued existence of this world (Olam Hazeh) is suspended in the balance of the deeds of humankind in their Nature. However the world tilts towards meriting destruction, the world is saved, moment after moment by virtue of our individual actions and those of other righteous individuals. Any invocation of divine justice and discipline is thus existentially dangerous. But on Passover, this invocation is permitted, because the invention of Bnei Yisroel is founded on the idea that its very identity as a people is only validated by it demanding justice and modelling loving, non-predatory consensual relationships, between all beings in the world. The continued existence of Olam Hazeh is thus bound up in the idea of an activist people helping to bend the history of the world towards justice through modeling compassion and loving-kindness. We should always merit to live up to these ideals and save the world from the suffering caused by the predatory behavior of those, like Pharoah, who persued in order to devour, and who were in turn devoured. Jewish identity is born at a cost — of taking responsibility to do good in the world: to increase fairness and behave with compassion (and this is my understanding for the song’s inclusion in the morning prayers read every day). We are grateful to Rabbi Hillel Ḥayim Yisraeli-Lavery for sharing his instructional videos (1, 2) with a CC BY-SA 3.0 Unported license. Rabbi Hillel Ḥayim Yisraeli-Lavery learned this tune at צוף דבש Tzuf Devash, a Moroccan synagogue in the Old City in Jerusalem. “שירת הים | The Song of the Sea, sung with a Moroccan Nusaḥ performed by R’ Hillel Ḥayim Yisraeli-Lavery” is shared by Aharon N. Varady with a Creative Commons Attribution-ShareAlike 4.0 International copyleft license. 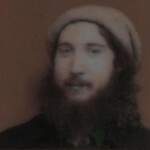 Please reciprocate for any adaptation or redistribution of this work by (1) properly attributing the work to Aharon N. Varady and R' Hillel Ḥayyim Lavery-Yisraëli, (2) clearly indicating the date you accessed the resource and whether any changes have been made (and if so, please be in touch with us and leave a comment below so that we might note your adaptation or improvement), (3) providing a link back to this source, and (4) specifying the Creative Commons Attribution-ShareAlike (CC BY-SA) 4.0 International copyleft license under which this work was shared.